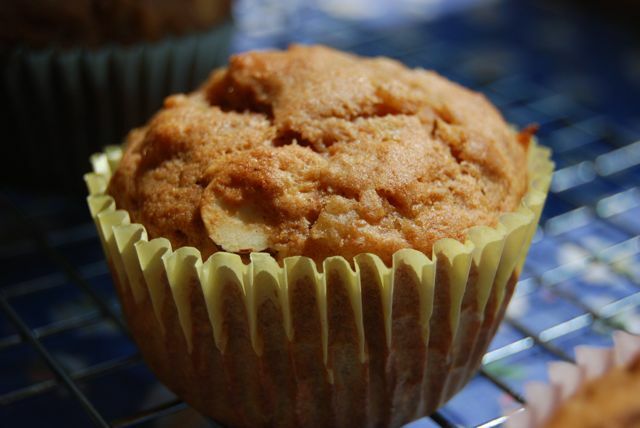 These subtly sweet muffins are low sodium, low fat and delicious! Recipe from Eating Well When You Just Can’t Eat The Way You Used To by Jane Weston Wilson. Yields 8 standard size muffins. Preheat oven to 375 degrees. Grease 8 muffin cups lightly with oil or line with paper liners and set aside. Sift the flour, baking powder and spices into a medium mixing bowl and set aside. In another bowl, stir together the pineapple, egg, oil, honey and molasses. Pour the pineapple mixture into the dry mixture and mix together with a rubber spatula just until the ingredients are evenly moistened. Gently fold in the almonds. Fill each prepared muffin cup with the batter, about 3/4 of the way. Place muffin pan on middle rack in oven and bake 10 minutes. Reduce heat to 350 degrees and bake another 15 minutes. Remove from oven. Remove muffins from pan and place on wire rack to cool. Serve warm or cool. Store leftovers in an airtight container. This entry was posted in Breakfast, Muffins. Bookmark the permalink. These were yummy! I had three warm out of the oven! I will make them again! your recipe didnt say whether to drain the pineapple so I didnt. Worked just dandy.